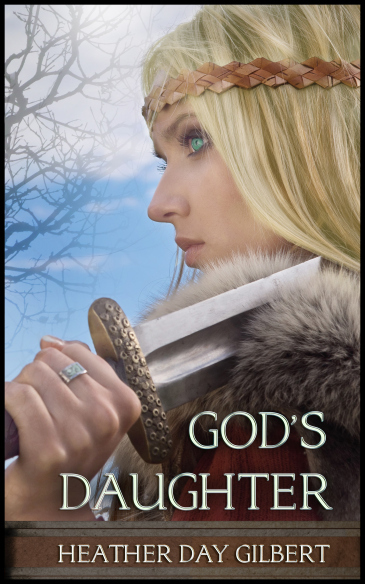 “God’s Daughter” by Heather Day Gilbert – an excellent Viking read! Title: “God’s Daughter” Book One in the Vikings of the New World sagas. My rating (0-5): 5 stars. But even as Gudrid faces down murderous crewmen, raging sickness, and hostile natives, she realizes her greatest enemy is herself—and the secrets she hides might just tear her marriage apart. Almost five centuries before Columbus, Viking women sailed to North America with their husbands. God’s Daughter, Book One in the Vikings of the New World Saga, offers an expansive yet intimate look into the world of Gudrid Thorbjarnardottir—daughter-in-law of Eirik the Red, and the first documented European woman to have a child in North America. As soon as I received this book and opened it’s beginning pages, I knew I was going to love it. First of all you should know, I’ve always loved the history involving vikings. I find it so interesting. “God’s Daughter” is super well-written. It captivates you. I really liked how uniquely it was written, truly. I loved Gudrid. Her character was very relateable for me right now. I love a character that you can understand what she is going through. Towards the end when she just felt tired from all the death (sorry for that spoiler! ), I identified; I grieved. Because I understand her feelings of being so weary. God always has me read books at the perfect time, and I think this was one of those. I’ve been tired and worn lately. There has been a lot going on. That allowed me to relate to Gudrid and reading this book has allowed me to also ‘grieve’ in my own way. When I finished it, I felt this deeper sadness in me, and I thought it was due to the book, but, I think more accurately, it is that the book just let all that surface in me. Now, I don’t want you to think this is the most depressing book – because it is not! It is a very good book, and one I’ll keep close. Yes, it’s evident about the struggles involved, but that is partly what makes it such a good read. It’s a real book, not just a ‘fluffy’ one. And there is happy parts in the book – I smiled many times during my time reading. “God’s Daughter” is an excellent book. It’s enlightening to the time period, and teaches you more without you even realizing it. It’s a rich book. The ages I would encourage to read this book would be from at least 16 years old and upward, only for some minor scenes of the pagan rituals and minor marriage references. Nothing huge at all, as it was all carefully written. I thoroughly enjoyed this book, and am eager for more in the series! I would definitely recommend this book. Heather Day Gilbert enjoys writing stories about authentic, believable marriages. Sixteen years of marriage to her sweet Yankee husband have given her some perspective, as well as ten years spent homeschooling her three children. Heather is a monthly contributor to Novel Rocket, a site dedicated to bringing helpful information to authors. Note: I received “God’s Daughter” free from the author in return for my honest and unbiased review. When a fire threatens the school grounds, William must decide to what lengths he is willing to go to protect his birthright. And when Patience’s brother returns with a new wife to take over management of the school, Patience suddenly finds herself unsure of her calling. After a surprising truth about William’s past is brought to light, both William and Patience will have to seek God’s plans for their lives-and their hearts. This is the second book in Sarah Ladd’s “Whispers on the Moors” series, but I think it could stand alone. It does relate to the first by characters and place, but you won’t be confused if you read this one without having read “Heiress of Winterwood”. I really liked the main character, Patience, and had an easy time relating to her. All the characters were pretty well constructed. The plot was exciting, but not to the point where you’re frustrated – I don’t much care for those kind of books. :D I did have a hard time putting this one down though, as I did with the first in this series. They’re just light Christian romances that are good. I appreciated the aspect of God being involved, though this second book didn’t deal with the relationship with God as much as the first. I think this book is well-written and handled well with being in the Regency era. The only thing I did not care for was the ending. It just did not jump out at me, and like the first, I didn’t care for the intimacy displayed. I think it was unrealistic and unnecessary. I do warn that, with all romances, there is the need to be cautious, because it is oh-so easy to fall into day-dreaming and such about ones own ‘romantic dreams’. Overall I did enjoy this book, and would probably read it again sometime! The rating I give it is 4.5 stars because of the ending not being as ‘innocent and correct’ as I should have liked. About the author: Sarah E. Ladd has more than ten years of marketing experience. She is a graduate of Ball State University and holds degrees in public relations and marketing. The Heiress of Winterwood was the recipient of the 2011 Genesis Award for historical romance. Sarah lives in Indiana with her amazing husband, sweet daughter, and spunky Golden Retriever. Note: I received “The Headmistress of Rosemere” free from Litfuse in return for my honest and unbiased review. I did quite enjoy this book, though I didn’t necessarily fall completely head-over-heals in love with it. To me, it was just a nice light and kind of ‘fluffy’ read. I really liked the aspect of dancing and fencing; I found that all very interesting, and well, good! I did not care for the main character, Julia, at first, but towards the end of the middle and in the end she improved and ‘grew on me’. I liked Aurora, Alec, Patience, Walter, and John Desmond probably the best. I was a little disappointed though, with a couple things. One, was how it was more romance than Christian. The story line was good, but it really did not touch on deeper, spiritual matters, which I think is the most important and winning aspect of a book. It was only in the end that anything related to the Lord was really touched on. Second, was how much, well to put it plainly, ‘deceit’ was going on between Julia and her mother, Lady Amelia. Julia was constantly going out behind her mother’s back and doing things Lady Amelia strictly warned against, as well as keeping many secrets. And that was never really put to right in the end. I was hoping, as I was noticing this, that Julia would realize just how wrong that was, and stop, but even in the end, she still did another incident of going behind her mothers back in secrecy and it was just ‘swept under the rug’ so to speak. I just didn’t like that. Other than those two points, I think it was good. Oh, and I really liked the fact that the Prologue and the Epilogue were written in first-person, like from Julia’s point of view; I thought that was neat. I also found the quotes and such at the beginning of each chapter, interesting and fun. Reading about English Dancing really made me wish I could attend an English ball of old. How fun that would be! About the author: Julie Klassen loves all things Jane—Jane Eyre and Jane Austen. A graduate of the University of Illinois, Julie worked in publishing for sixteen years and now writes full time. She is a three-time Christy Award winner and a 2010 Midwest Book Award winner for Genre Fiction. Julie and her husband have two sons and live in a suburb of St. Paul, Minnesota. Note: I received “The Dancing Master” free from Litfuse in return for my honest and unbiased review. As I mentioned in previous post, I was hoping to post my review of the first book in the “Whispers on the Moors” series by Sarah E. Ladd, and now I am. This review is just of my own choice – I requested this book from the library and did not receive it from a publisher to review. Amelia Barrett, heiress to an estate nestled in the English moors, defies family expectations and promises to raise her dying friend’s baby. She’ll risk everything to keep her word—even to the point of proposing to the child’s father—a sea captain she’s never met. I really liked this book. I was impressed by the writing, as well as the story itself. The characters were all excellent – so “warm” if that makes sense. The book was just the right length, and for it being Mrs. Ladd’s first book, very well written. It made you admire the characters, then fall in love with them, then it gripped you as the plot got going, and then calmed you again in the end. I really did love this book; all except for the ending. And by ending, I simply refer to the last two pages. I had really hoped it wouldn’t end like so many other romances. Alas, though, ’twas not the case. I guess I just wished it could’ve ended on a more ‘innocent’ or ‘pure’ way. It would’ve been just as good – better in my opinion. But that aside, I really enjoyed it, and it might just end up on my ‘favourites list’. :) I really appreciated how God was obviously kept in it and involved. Note: The ending isn’t inappropriate or anything; I just didn’t care for it. I am so sorry I have not been posting more. I really was planning to, but then we’ve been on a real roller coaster. It’ll get smoother soon, I’m sure. For now, I’ve just got another give-away to share with you. My review of “The Headmistress of Rosemere” will be posted on the 26th. I am hoping to post my review of the first book in the “Whispers on the Moors” series soon, but we’ll see. I’ve been reading a lot lately. Which has been nice. :) But besides the reviews I’ll post, I do hope to get regular posts in here and there! Enter Today – 1/17 – 1/28! Julie Klassen’s “The Dancing Master” giveaway and “All Things Jane” webcast 1/23! Enter Today – 1/6 – 1/23!